So there is new toned milk in town – Sach. Sach is the new private label brand from the stable of Future Group of Big Bazaar fame. It will have many other things like Apparel, cooking oil, toiletries etc under the same brand name. 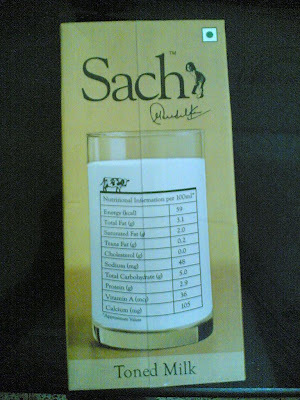 I didn’t know anything about Sach when I entered Big Bazaar today and was attracted towards it by Sachin’s association. 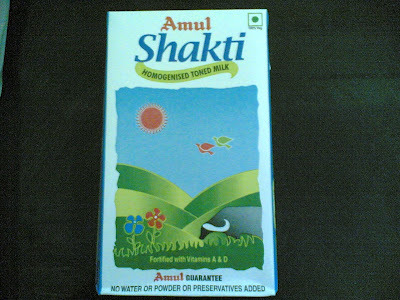 The price was Rs 42- a good Rs 10 higher than the standard Amul Toned Milk. Though today Sach was available for Rs 33 – a special Food Bazaar Offer. Testing the waters, I thought. A consistent toned milk drinker for the past 4 years and like a true early adopter I bought one pack. 1. Packaging: The brown Colored pack stands out – amidst the general Blue and white of the other brands. But for me a brown color doesn’t give a direct association with Milk . A blue or white is easily recognizable. 2. Price sensitivity: It is priced at RS 42 – at a premium to the normal available milk. Will the consumer be ready to pay this premium just for the Brand Name. Hard to say. I will not – ya despite Sachin being there all over the packaging. 3. Health Benefits: Ok. I can for once think of buying it if it gives me added health benefits – may be a competitor to the Amul Gold or the double toned milk. But just compare a standard Amul toned and Sach toned milk. So what do you infer from the table above. Common perception says that Amul is far better in terms of nutritional value at much lesser the price. Further problems for Sach occur due to the fact that it seems they are trying to play primarily on the health aspect - they have their nutrient values boldly pasted on the front of their packet (Amul has it in miniature font on a side). Their primary motive is to position the brand as ‘Healthy’ – not only milk but everything associated with the Sach Brand (Source). So maybe they will succeed in this effort by offering health benefits upfront – but just a casual look under the hood reveals a starkly different picture. 4. Availablilty: Sach will be available only at Big Bazaars as of now. Now I don’t have any statistics on the percentage of milk being bought from modern trade channels but just observation of going to a big bazaar for the past 2 years tell me – very few! Mostly prefer to buy it from the mom and pop stores. Why? The perception of being fresh. Though you can keep a tetra pack for 2 months without opening but the general tendency is to buy small quantities at regular intervals. Now keeping this in mind, can Sach compete with the highly efficient and well set distribution network of Amul? May be in their own stores but what about outside. 5. Brand Association of Amul with dairy products is very strong and that is some more challenge for Sach to break the mould and get into consumers mind and then the refrigerator. Amul may have become a generic brand and Sach may be attempting to break the clutter – but very difficult. As of me, I am not buying it if it is priced more than Rs 33 and not available at the shop next door. Well the move i believe is generously borrowed from More. By focusing more on their own brands, they are increasing profit margin and reducing threat of suppliers (Porters 5 forces model). Its a good strategy.. They may be earning a lot more as % of profitablity on Sach vis a vis selling a AMUL. Though i agree with ur obvervations that the packaging looks like that of a choco milk or soya milk.. The price point as u ve rightly pointed out is also too high..